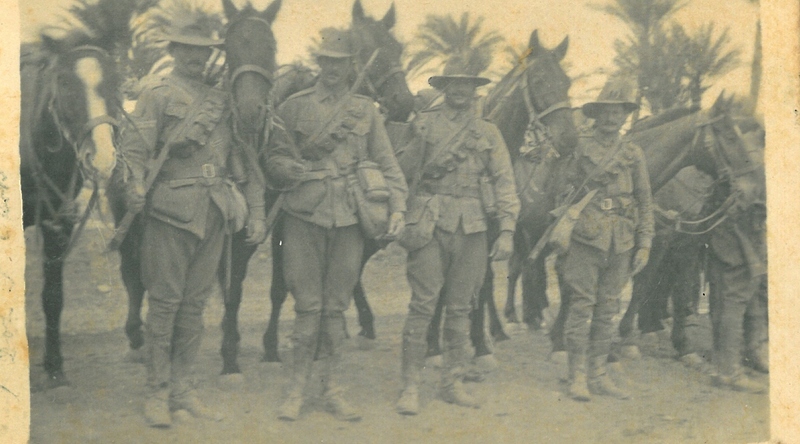 Members of the Australian Light Horse in the Sinai Desert 1916. While the entire Australian army fought at Gallipoli, only a small number remained to fight against the Ottomans in the rest of the war. The Australian Light Horse stayed in the Middle East while the vast majority, five Australian divisions, split off to fight a separate war on the Western Front against Germany. The Light Horse were a ghost of previous wars whose most effective tactic was the cavalry charge with sabres. Both horses and sabres were becoming obsolete in the 20th century. The Light Horse was the embodiment of the Australian bushmen but the horses were ineffective on the cliffsides of Gallipoli and in the trench warfare of France and Belgium. The horses however did give them mobility and they would be useful in the Sinai and Arabian Deserts. In 1915, the Light Horse sat out the April 25 landing at Gallipoli but as the death toll mounted in May, they were drafted in without their horses and suffered casualties in large numbers. The Light Horse again missed out when the infantry was sent to France. They would stay behind in Cairo to help defend the Suez Canal and launch raids into Ottoman-controlled Palestine. The Aussies repulsed the Turks in Sinai at Romani and pushed east under new leader Harry Chauvel. Gaza was a crucial gateway to the Holy Land and the Allies failed to take it in two sieges in 1917. For the third attempt Chauvel’s men made an audacious charge on the wells at Beersheba, armed with bayonets instead of traditional swords. The full-paced charge over machine gun fire late in the afternoon of October 31, 1917, crashed through the terrified defenders. Beersheba fell and within days the Turks abandoned Gaza. Before the year was out, the British Army had taken Jerusalem. The war was still far from over for the Light Horse who endured reverses in 1918 in the Jordan Valley. There the enemies were heat, flies, lice, scorpions, dust and sickness as much as the Ottoman army. They were re-issued with swords, allowing them to fight on horseback and took part in a big coastal offensive which forced the Turks to retreat. The Light Horse marched into Damascus in triumph bringing the desert war to an end in October 1918. About 1500 Australian soldiers died in the campaign, many of sickness and disease. The Light Horse had 130,000 sturdy Waler horses that they loved as dearly as life. But at the end of the war they were either sold or transferred to the British and Indian armies. Many soldiers preferred to shoot the horses rather than have them put to cruel use. In later years the talk of Light Horsemen was of their beloved horses and the tragedy of leaving them behind. The only horse to return home was Sandy, the mount of commander of the Australian 1st Division, Major General Sir William Bridges. General Bridges was killed in a sniper attack at Gallipoli in 1915. It was his dying wish that Sandy should return to Australia. The horse was transferred to France and in 1917 the Minister for Defence called for Sandy to be returned for pasture. He arrived home in 1918 and the official record says he was “pensioned off”, turned out to graze for the next six years at Remount Hill, the home and training ground of the Light Horse Brigade. Sandy’s eyesight failed with age, and his growing debility prompted the decision to have him put down, “as a humane action” in May 1923. The days of horsemanship in war were also numbered. The ruins of Villers-Bretonneux photographed in April 1918 (Australian War Memorial). As 1918 began, Germany was deeply worried by the US entering the war. The Americans were mobilising in large numbers so the Germans needed to win the war before they arrived. The Russian Revolution ended the war on the Eastern Front, and Germany rushed its troops to France for a major offensive in March. Using massed artillery and “stormtrooper” tactics which foreshadowed Hitler’s Blitzkrieg, they forced the British Army back 50km to the Somme over the graves of previous battles. General Gough’s Fifth Army took refuge in Amiens, a vital communications hub, and Gough diverted the Australian divisions from Flanders to defend gaps in the line. By the time they arrived, German momentum was weakening. They attacked heavily at Villers-Bretonneux, 25km east of Amiens, but the Australians drove them off. The following day they repulsed the Germans further north at Hébuterne and Dernancourt. The Germans launched another major assault on Villers-Bretonneux on April 24. Two Australian brigades with British units counter-attacked that night in a pincer movement, yelling as they charged under machine-gun fire. The following morning, Anzac Day, the Germans were in full retreat. Amiens was safe. A hill overlooking Villers-Bretonneux was selected as the site of the Australian National Memorial in 1938. It was repaired again after being damaged in the Second World War. As 1918 progressed, the Americans arrived on the battlefields in large numbers shifting the balance to the Allies. Birdwood handed over command of the Australian army to Sir John Monash. Monash was a civil engineer from Melbourne who understood the need for organisation, initiative and good morale. The division in Flanders defending Hazebrouck was moved to the Somme bringing the five divisions under Australian command. Monash attacked at Le Hamel using Australian and American troops on a battle set appropriately for July 4. Supported by new Mark V tanks, aircraft and artillery, Monash’s infanty achieved their objective in a brilliantly planned attack. Le Hamel was possibly Australia’s finest hour in the war. On August 8, two Australian divisions joined a massive attack on weakening German positions on the Somme. Over 2000 Australians died in one day, but the Germans were routed. General Ludendorff called it “Der Schwarze Tag” – Germany’s black day. Monash drove the troops to Mont St Quentin and Péronne, a strongly defended riverside town. In bloody hand-to-hand combat, Australians won eight Victoria Crosses in three days, the largest of any engagement in the war. The Germans withdrew to the Hindenburg Line while Monash urged the exhausted Australians on, despite crippling losses. It was a race against time with winter approaching. In his final attack of September 29 at St Quentin Canal, Monash commanded more “doughboys” (as the Americans were called) than Australians. The Allies finally breached the Hindenburg Line and Germany’s war was lost. Amid a total retreat, most of the Australians saw their last action capturing Montbrehain on October 5. They handed over to the doughboys and sat out the last month of the war. The year 1918 claimed 12,000 Australian lives on the Western Front. The last to die were three pilots and three tunnellers in a British attack at Sambre-Oise on November 4. The war ended on Armistice Day a week later though a defeated Germany never admitted the word “surrender”. Around 60,000 Australians died in the war out of a total of 17 million worldwide, seven million of those civilians. The war changed borders, with ramifications the world is dealing with 100 years later. European power was fatally weakened and three empires collapsed. Yet nations did not heed the lesson of the “Great War”. The unsatisfactory nature of the peace led to an even bloodier conflict 20 years later. Australia would again serve in Britain’s interest, but would also be forced to defend its own borders as Japan emerged as a global military power. 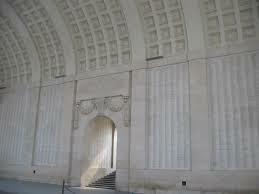 Over 6000 Australian names are on the Menin Gate to the Missing at Ypres. As the winter of 1916-1917 ended, Allied troops on the western front were treated to an unexpected sight. The Germans had begun to withdraw. It wasn’t far, just a dozen kilometres east to a new defensive zone which the British quickly dubbed the Hindenburg Line. The fleeting tonic the withdrawal gave the Allies was illusory, this German position was stronger and better-prepared. 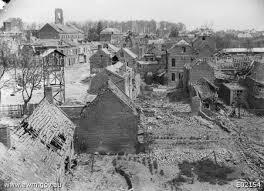 The Australians marched into the gap and arrived at the ruined and empty town of Bapaume near Amiens. It was St Patrick’s Day but there was little to celebrate. Germans snipers held outposts beyond the Hindenburg Line and took murderous casualties. By April the two armies faced each other again on the new Line. The four AIF divisions that fought on the Somme were part of the 5th British Army ordered to Bullecourt. General Gough repeated his mistakes of Pozières. The Australians had to take the Line without artillery and it took two bloodsoaked weeks before the Germans withdrew. The Australians lost 10,000 men in two attacks that achieved little. Bullecourt convinced Australian soldiers that the British brass was incompetent. Field Marshal Haig’s next plan was to send the army back to Flanders and drive the Germans from the ridges around Ypres. Ypres was one of the earliest battlefields in 1914 and had been in stalemate for three years. The first object was to take the Messines-Wytschaete ridge to the south of Ypres in an audacious underground plan. The Battle of Messines on June 7, 1917 was the Australians’ first large-scale encounter in Belgium. Men from the 1st Australian Tunnelling Company used their mining experience to lay thousands of explosive devices under German positions. The force of the bombs detonated the ridge and the din could be heard in London. A memorial to the tunnellers now stands on Hill 60. The Australian 3rd and 4th Divisions and New Zealanders attacked the shattered defences of what was left of the German line. They got as far as the ruined Broodseinde village still held by the Germans on a higher ridge. The Australians attacked under the cover of a creeping barrage, taking the heavily defended town, perhaps the most complete victory yet by the Allies on the Western Front. With the Germans tottering, the fates stepped in: it started to rain. Within days the slimy muck dragged every advance to a halt. On October 12, the 3rd Division and New Zealanders attacked the high village of Passchendaele. Artillery support was weak and the rain was relentless. Australian infantry were stuck in the mud in front of heavy machine gun fire and casualties were enormous. The Germans counter-attacked and the exhausted Anzacs retreated in a rout. They lost 7000 men at Passchendaele. The Australians left to regroup and the Canadians took over the position. The Allies made gains but nearly half a million men died at Ypres in 1917, their tragedy compounded as almost all the ground was lost again in the German Spring Offensive of 1918. War historian Charles Bean calculated the five Australian divisions lost 38,000 men in the eight weeks of Ypres. Six thousand Australian names ended up at Ypres War Memorial, the Menin Gate Memorial to the Missing (erected ten years later). As 1917 ended, Prime Minister Hughes had another go at introducing conscription. On December 20, the referendum suffered another narrow defeat as Melbourne’s Archbishop Mannix urged Catholics to vote against it. The AIF would remain a depleted volunteer army as it entered 1918. Yet despite years of deadly war, morale remained surprisingly high. The Aussies were calling themselves “Diggers” and the five divisions were brought together as the Australian Corps, under Gallipoli commander William Birdwood. Moscow was burning in the Russian revolution but America was finally in the war bringing a belief that after four years the tide was finally turning. I’m over half way through a 6-week online course Trinity College Dublin is offering in Irish history called “Irish Lives:1912-1923”. Not part of any degree and no real certificate at the end but being free and having 17,000 participants it sounded intriguing. I learned about it a week after it started so I’m still wading through Week 4 as this week 5 ends. I wasn’t sure I needed a third history project to go my study into an Australian Treaty with its Indigenous People, and a biography of Irish-Australian James Dalton. The Treaty is something I’ve come to believe in while Dalton had an amazing life surviving orphanhood in the Irish famine to being in a gold rush in Australia and ending up one of the wealthiest and most influential Catholics in the country. I thought the Trinity course might offer perspectives on Dalton because his son-in-law John Redmond was so important in Ireland from 1912 to his death in 1918. 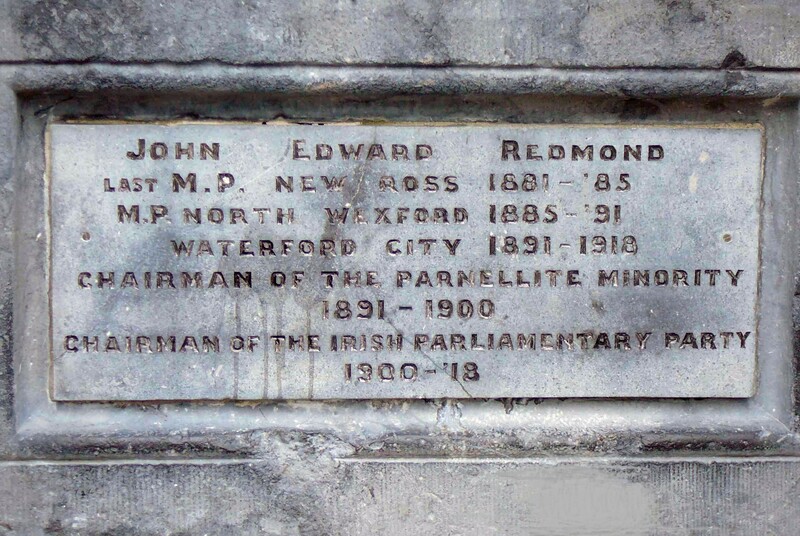 A Wexford man, he represented New Ross in parliament before moving to Waterford. Brother Willy later became MP for Wexford and he was the only MP to be killed in action in the First World War. John and Willy’s 1883 visit to Australia brought the Dalton and Redmond families together. Dalton was one of Redmond’s biggest supporters in Australia and he paid a heavy price, losing a magistrate position on claims of treason. The Redmonds repaid their support in kind. John married Dalton’s half sister Johanna, Willy married Dalton’s daughter Eleanor. I wondered if Redmond’s Australian family influenced his thinking as he took thousands of Irish to war in 1914. I am enjoying Irish Lives immensely, despite playing catch up. The video lectures make us think about individual motivation and there is plenty of digitised primary material to study. The Bureau of Military History is full of great stories from the era. I’ve really enjoyed Muriel MacSwiney (Terence’s widow on how she got into politics through nationalist newspapers and the conviviality of a Cork bookshop), Ned Broy (on the organisation of the DMP and the looting during the 1916 Rising) and some Waterford ones John Riordan and Paddy Paul who both fought continuously in wars from 1914 to 1923 (both ending up as Free Staters). Paddy Paul followed the wishes of his local MP. When John Redmond said they should go to England’s war for Ireland he went to that war. Paul was in an Irish regiment in Macedonia during Easter 1916 and Ireland’s Rising was never far from their minds. All the men openly cheered for good news from the rebels, who fought against the army they were serving in. Most of the Irish soldiers abroad joined the Volunteers in 1919. By then Redmond was dead and his dream of Home Rule dashed. Paul came back to fight the British in Waterford. There was a second semi-related reason I took on Irish Lives. I hoped the 1912-1923 period in Ireland might also inform my thinking about treaties in Australia. Most people in Ireland accepted the Treaty process was legitimate even though they were split by the outcome. The most interesting thing I’ve found is the full text of Robert Brennan’s book “Allegiance”. Brennan was an important Sinn Feiner and undersecretary for foreign affairs 1921-1922 as well as being the fledgling regime’s publicity officer. Brennan reminded me of another Irish Treaty, The 1691 Treaty of Limerick, that confirmed Protestant rule in Ireland. Brennan quotes Erskine Childers saying the Irish underestimated the British who always found ways “to repudiate their signatures”. Brennan also speaks of a meeting he had with Eamon De Valera and Michael Collins in 1921 as both Ireland and Britain looked for a way out of the war. Brennan said a man wanted to meet them, believed to be a British spy named Tom Jones (it’s not unusual). Brennan told Dev and Collins that Jones said he knew people in London who could bring a settlement. Collins replied eagerly that they should meet him and find out his game. De Valera said no, he didn’t want to meet a spy. Instead he told Brennan to give Jones a message.”(M)y opinion is that the British should offer to negotiate a Treaty with Ireland as a separate state. We can meet on this ground”. Britain was at the height of her imperial powers in the 1880s and Australia wanted its reflected glory as a Little Britain of the South Seas, and its humble beginnings as a prison colony among a native of “savages” was deliberately forgotten in this new narrative. White colonists ruled by the gun and never had to treat with the Indigenous people it encountered in Australia. By the time of the events of Irish Lives, the colonies had come together in a white federation. The Aboriginal people were written out of the young nation’s constitution, forgotten and expected to die off. Though things have improved, Australia has never offered to treat Indigenous people for its thefts. They need to do as the English did with De Valera, negotiate as a state and “meet on this ground”. 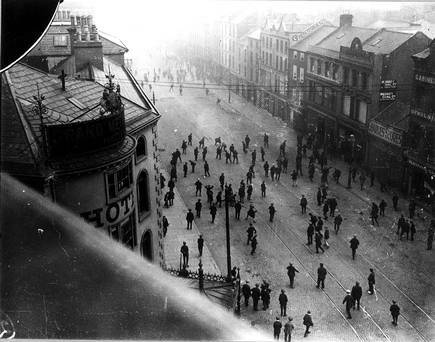 A sectarian riot in Belfast, 1920. We are three weeks into Irish Lives and at the half way mark. But I’m still behind, only completing a third of the course so far. I started at the beginning of Week 2 and thought it wouldn’t take me long to catch up. But I didn’t finish Week 2 until today. I’d say I’ve done six to eight hours a week so far, which is more than the recommended dosage, but it’s taking me longer expected to go through the material. This is no fault of the lecturers. Prof Ciaran Brady in Week 1 and Dr Anne Dolan in Week 2 have skilfully steered the course through fascinating traffic. The “problem” they have offered is a voluminous set of digitised primary sources, wonderful first-hand texts now within reach of anyone with internet access. It’s proving buried e-treasure. I said Week 1 was a straightforward chronology of the events. What I didn’t immediately pick up was why the course was called “Irish Lives” and not, say, “Irish History”. People are the focus not great events, though every person was deeply affected by those events, in Ireland and overseas. Week 1 placed Ireland in the context of world affairs. War mattered to Ireland between 1914 and 1923 but so did culture. Films like Charlie Chaplin’s The Kid preoccupied in Ireland in 1921 as much as independence did. Todd Andrews was a young man when he fought in that war, a story he tells in his autobiography “Dublin Made Me”. Andrews’ memories of the first 20 years of the 20th century say as much about working-class Dublin’s preoccupations with football (Bohs or Shels) and cricket (Kent or Surrey) as they did about changing the government. The Irish were part of the world’s biggest empire and they absorbed the correct British attitudes to the “Fuzzy Wuzzies, Niggers and Indian Nabobs”. Dubliners knew more about Belfast than they did about Cork. Dublin was a British city no different to Manchester and Birmingham save in one crucial respect: it was mainly Catholic. For Protestant Belfast, Home Rule in Dublin was anathema and the Curragh Mutiny proved it would never be imposed on them by force. The First World War gave everyone the chance to support their monarch for their own reasons. The monarchs Willy, Nicky and Georgie conducted a family spat at the cost of millions of lives, but each each of those lives had their own reasons for being in battle. If Prof Brady’s approach in Week 1 was a “great man of history theory”, Dr Dolan’s approach in Week 2 went into lesser histories to find out what it meant to fight. We moved away from “the stylised wars of our imagination” to examine the lives of ordinary people caught up in extraordinary times. What motivated them? She offered places to find the answers, including important secondary sources preaching down the history of Ireland. But better still are the primary sources; the words, stories, images and art of the people who lived in those times. Those people are almost all dead now but these Irish Lives live on in bits and bytes: at RTE Archives, the Bureau of Military History, British Pathé and National Library of Ireland – all have rich databases, some are haunting. British Pathé pictures of Belfast refugees fleeing the riots of 1920 reminded me of people in Aleppo and Homs in today’s Syria. Some stories are extremely detailed. The testimony of Collins’ primary intelligence agent at Dublin Castle Eamon Broy is over 100 pages long and a gripping insight into how those who fought in 1919-1921 learned from earlier conflicts. Broy joined the Dublin Metropolitan Police to pursue his love of athletics and he was careful to draw a distinction between it and the RIC. The DMP was paid partially for out of the rates so Dubliners did not consider it a “British” police force unlike the paramilitary RIC (and its network of spies) that kept order in the countryside. Broy and many other DMP officers had republican sympathies and he was a crucial source of information to the rebellion. Broy and Collins laid out a plan to “melt down” the RIC and its network of spies to overcome “British Providence” that so cursed the planning of previous Irish revolutions. The testimony of Dungarvan revolutionary John Riordan was fascinating for different reasons. I was attracted to his story as a fellow Waterford man and Riordan spent nearly all of the period in military activities. He signed up to the British Army in 1914, fought and was injured at the Somme in 1916 and when the war was over, he was posted to quell a rebellion in Egypt. Riordan was silent about what he thought of Egyptians rebels. Did he see them as Niggers and Nabobs like Andrews or independence seekers like he was about to come? In 1919 Riordan took off his British uniform and went back to Co Waterford to join the “Volunteers”. His military experience was invaluable and he took part in successful operations at Piltown (near Dungarvan) and Cappoquin. He was also involved in the only operation in East Waterford in that war: at Pickardstown outside Tramore on a cold winter’s night of January 6, 1921. That ambush was a failure and a perfect example of the fog of war. Someone in another platoon fired too early leaving Riordan’s men confused with nothing to aim at. “We were ‘in the dark’ in every sense of the word,” Riordan said. “Nobody seemed to know exactly what was happening”. Yet there were people who knew exactly what was happening and they used both blatant and subtle messages to get their point across. The British government knew they needed men for their war and they lured people in with decent pay and the prospect of a bit of excitement. For those that needed more encouragement “Pals battalions” sprung up so volunteers could go to war with their buddies. The nationalism messages were specific to Irish concerns. Posters encouraged people to go to France “for Ireland”. It was no surprise the Irish Free State government quickly learned the value of propaganda of doing things “for Ireland”. In 1922 they issued handbills criticising the anti-Treaty fighters with a cartoon showing them hiding under the bed during British rule. The message they were cowards who fought against their own. The rebels responded with menace: grim pictures of dead men in Irish fields, and public warnings against anyone thinking of executing the hiding de Valera. Whether it was at Gallipoli or Galway, war was a dangerous place, but was also wonderfully exciting. Many soldiers worried it would be all over before they got there. It didn’t take long for the bloody conflict to dispel their sense of adventure. Emmet Dalton’s Royal Dublin fusiliers lost 800 men at the Somme in one day, a death toll far out of proportion to the battle’s objectives. “When we finished, I marched out with 98 men out of 929 that went in,” he said. Dalton was proud of his service for the Crown but like Riordan he returned to play a big part in the War of Independence and Civil War. Dr Dolan said both of these wars were civil wars pitting Irish people against Irish. The Royal Irish Constabulary were hated symbols of British oppression but its men were mostly Irish Catholic. The furtive nature of those wars left its participants jumpy and shooting at shadows. The Black and Tans and Auxiliaries saw all the Irish as hostile Shinners but they killed more cows in the dark than people. This was a dirty war with dirty tactics on every side. If the British did not like themselves in Ireland, the Irish too had their demons with many suffering nightmares from the killings they did. There were other kinds of fighting that did not involve guns or bullets: women fighting for voting rights and prisoners wanting political treatment. Hunger strikes, force feeding and the ceremonies of death all played their part. Funerals especially were great fodder for inspiring martyrdom. Pearse’s graveside oration for the old revolutionary Jeremiah O’Donovan Rossa in 1914 was a masterclass in stirring up support for the nationalist movement. The British fools had left the Irish their Fenian dead, Pearse intoned, and holding these graves, “Ireland shall never be at peace”. Pearse’s own martyrdom in 1916 was a powerful war aphrodisiac while even peace-loving cardinals and prelates jostled for position at the funeral of another rebel Terence MacSwiney. The British too knew the value of ceremony by laying out the bodies of its Bloody Sunday dead in Westminster Abbey. The rite was so powerful the Free State held onto the bodies of anti-treaty rebels until the war ended for fear of the impact the funerals might have. Many Irish paid with their lives like 16-year-old Belfast girl Ethel Burrows out on a Saturday night with friends and shot dead for being in the wrong place at the wrong time. Or Michael Collins at 31, chasing republican shadows at Béal na Bláth. As bitter as Ireland’s troubles were they took place in a period of extraordinary violence across Europe. Ireland was dangerous by British standards but not by the standards of the Western Front or the Balkans, Turkey, Russia or the Middle East. Those who survived were scarred by the fighting, many carrying a bitterness towards enemies, real and perceived, to their dying days. The British irregulars went home frustrated they couldn’t have a free hand to solve the Shinners problem, Free Staters could not forgive rebels while the rebels could never forgive the new Ireland for not matching their vision of it. De Valera survived the war to dominate Catholic Ireland’s politics for another 40 years. Eamon Broy helped shape the new Free State as head of the Garda Síochána. Todd Andrews led Bord na Móna and the CIE while Emmet Dalton became a successful filmmaker. War was a dangerous furnace but for many, fighting forged their future. 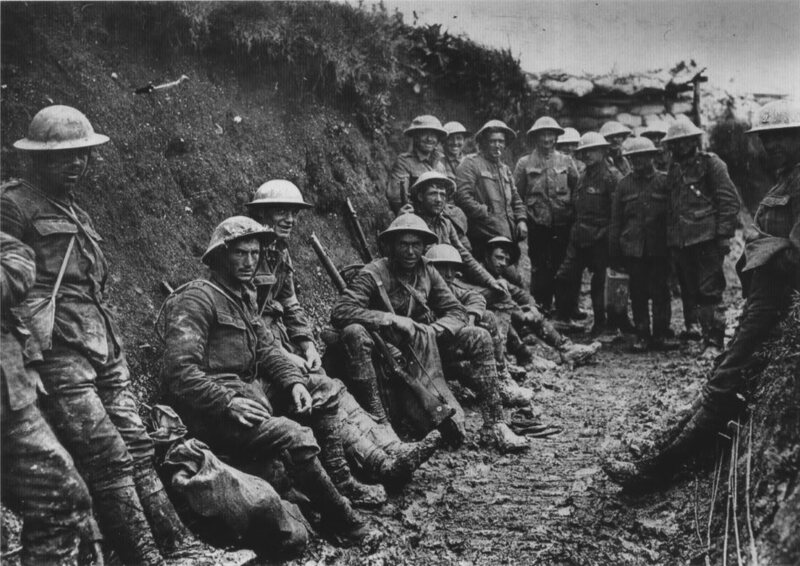 Australian soldiers at the Somme (Australian War Memorial). The Australian Army spent the new year of 1916 in Cairo licking its wounds from the Gallipoli campaign. It needed a fresh injection of blood and got it in large numbers as “Dungaree Marches” across Australia landed new recruits by the thousands for the volunteer army. From March 1916, the Australians began leaving Cairo. Four divisions (1st, 2nd, 4th and 5th) were sent to Flanders in Belgium. Though half were already battle-hardened at Gallipoli, the Western Front presented a fresh set of hells such as wet and cold weather, muddy trenches, murderous machine guns and nerve gas, and later tanks and airplanes. The Australians were given ‘the nursery’ to defend, near Armentières just over the border in France. It was a quieter part of the Front but this was no place for infants and 600 Australians died in under three months defending the borderline. Private William Jackson became the first AIF soldier to win the Victoria Cross in France. He captured a POW (greatly valued for their information) and then rescued wounded members of his raiding party from no man’s land until his arm was blown off by a shell. It didn’t take long for the Australians to outgrow the nursery. The main British Army in France was 100km south of the border, concentrating its force on the Germans on an important river crossing. The Battle of the Somme was planned as a massive war of attrition to frighten the Germans into retreat. British soldiers were ordered to deliberately walk slowly across no man’s land as bluffing generals thought this would unnerve the Germans. It didn’t unnerve German machine gunners and 20,000 died in the first hour. At the end of the day 60,000 attackers were slaughtered – Britain’s highest ever one day casualty list. As more of those other fellows died in the battle, three of the four Australian divisions were sucked in. On July 19, 1916 the 5th division attacked Fromelles but the poorly prepared Australians lost ground to a German counter-attack. It was the worst 24 hours in Australian military history. More Australians died that day than in the combined Boer, Korean and Vietnam wars. They suffered 5500 casualties, a devastating blow with some divisions losing entire ranks. Pozières was the next killing field for many Australians. On July 23, the 1st Division attacked the town under artillery fire for five days at the cost of 5000 men. The 2nd Division came to relieve the 1st and suffered another 2000 casualties. They were followed by the 4th division who attacked nearby Mouquet Farm. The narrow front exposed the Australians to murderous shell fire and counter-attacks. Over 42 days, the three Australian divisions attacked Pozières 19 times, 16 at night, at the cost of 6000 dead and another 17,000 injured. Those who survived put it down to endurance and luck. The front line barely moved at the end of it. In September the exhausted and depleted Australians were sent back to Flanders to recover their strength. Prime Minister Billy Hughes could see appalling losses taking a huge toll on the AIF. Britain’s own volunteer “Kitchener Army” was also cut to pieces (and Kitchener himself was dead) and needed conscription to top it up. Hughes became convinced Australia also needed conscription. The issue split his Labor party and the Senate was hostile. When Hughes took it to a referendum on October 23, 1916 the No vote narrowly won, but Hughes remained committed. He left Labor to form a coalition government dedicated to over-turning the result. The news was no better for the resting men in Flanders, ordered back to the bloodbath in the Somme as winter approached. All four divisions were posted to France as this enormous battle rolled to an unsatisfactory conclusion after five months. Muddy conditions left both sides virtually immobile in an uneasy truce punctuated by raids and shelling. Men succumbed to respiratory diseases, rheumatism, frost bite and “trench foot” (a rotting condition caused by prolonged standing). A bloodfest that started in high summer, the Battle of the Somme ended in the damp wintry squib of November. Hundreds of thousands lay dead and only a handful of kilometres changed hands. The overall state of the war was the same in January 1917 as it was in January 1916. The Australian Third Division was finally raised by trainees in England and they arrived on the front as the year ended to make it five divisions in France. But the patriotic enthusiasm Australians had in 1914 and 1915 for this great adventure was long gone. Those who went home wounded brought back news about deadly modern warfare. Their missing limbs and broken spirit spoke of a quieter horror no one was yet ready to confront. The nightmare would continue for two more years.